I love Halloween. A lot. I went to two, count 'em two, universities known for their incredible Halloween celebrations. Court Street, the main drag at OU, packs so full of people over Halloween weekends that it's literally almost impossible to walk down the street. People shotgun beers & flash their goodies in the middle of the road. (Hey, I'm not sayin' it's classy, I'm just sayin' it's crazy.) I spent three fantastic Halloweens there, excluding the half hour I spent crying & lost outside an abandoned Burger King standing next to an Amish couple. And also excluding the huge verbal blowout I engaged in with a few sorority "sisters." Anyway, bygones. Back to Halloween. I LOVE HALLOWEEN. I love coming up with costumes that make people laugh, costumes you won't see on every other person, costumes that are not "a slutty _____." I love pretending to be something else, pretending to be something crazy. At home, I've been known to force friends into pumpkin-carving & passing out candy to neighborhood kids. I am the biggest haunted house aficionado you'll ever met, & also one of the biggest wusses. Everything about Halloween exhilarates me. DC does not love Halloween. My friends here are, to put it mildly, just not that into All Hallows Eve. They'll dress up, sure - sort of. They'll tack on a cape or a wig at the last minute, but nothing that requires much creativity. And there are no haunted houses in the city, just out in the 'burbs, which I cannot get to because I lack a vehicle. And I don't have a front porch for pumpkins while I reside in an apartment complex. Needless to say, Halloween in the District has been incredibly disheartening for two years in a row, & shaping up for a third. But this year, it's myself I'm disappointed in. I was too busy having the dreaded swine to come up with a good costume, & now I'm 24 hours before the big day with not an idea to be found. Everything is lame. I am lame. In 2003, I was Quailman. I saw two others, but I was the only Quail(wo)man. And my head belt was real, not cardboard. In 2004, we were crayons - pink & purple. My entire sorority house dressed as "Moulin Rouge" charlatans, & there we were in the house photo, dressed like giant 12-year-olds. 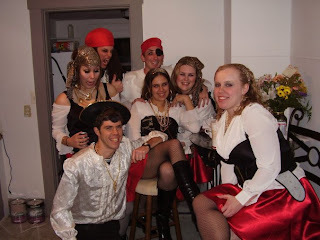 In 2005, we were pirates. Not that creative on the surface, I know, but we did it damn well - & before "Pirates of the Caribbean" was a thing. Also, my hair was crimped so... score. Oh yeah, & my friend Annie took a pair of scissors to my crotch so that I could use the restroom while wearing a bodysuit. In 2006, I was the Keebler Elf. I was bald, so my costume revolved around my desire to wear a wig - & wig-wear, I did. I also passed out cookies from a cauldron. And later passed out on a friend's couch. 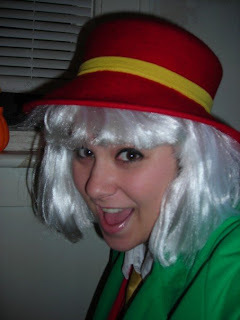 In 2007, my first year in DC, I was so bummed about all the Halloween-hating that I didn't try very hard. 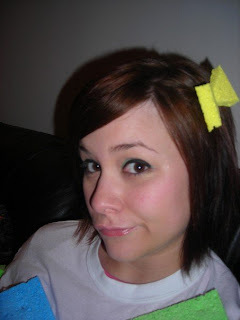 I sewed some sponges to my clothes & told people I was "self-absorbed," complete with sponge hair accessory. I met a kid dressed up at "road head," & together we affirmed that we were, indeed, wittier than everyone else. In 2008, I went the witty route again. 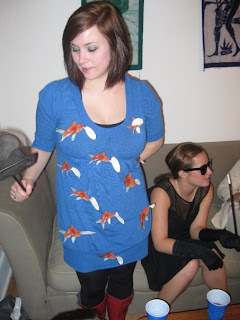 With a pair of galoshes & some laminated, laudatory fish pinned on a blue dress, I was "fishing for compliments." Beat THAT, wordsmiths. This year, I've got nothing. I am costumeless. I am pumpkinless. I haven't eaten a single candy corn. I've not visited a single haunted house or bobbed for a single apple (OK, I never did that). The Midwest would be so disappointed in me. In short... I have failed myself. 2. Why were you bald? 3. Have you toured the Brewmaster Castle? That sucker's GOTTA be haunted! Please hop on the next plane and come down here for our party tonight! We LOVE Halloween. And I miss you. This Midwest girl didn't do so hot this year either. I think Halloween just kind of snuck up on everyone this year with the weird weather. I'll be back in full form next year! You will be too, my sweet! oh wow, I love your witty costumes. Sorry this Halloween is sucking :( I'd send you candy corn if I could. "Fishing for compliments" and "Self-absorbed" are the absolute best! Awww, don't beat yourself up -- your last couple years were AWESOME! I really love the Keebler Elf, and if I'd been there, I would've reeeeally loved the cookie part. That's sad to hear! I actually thought DC has some sort of Halloween party scene- I know the last two years I was able to party it up around town. This year however I'm putting on a musical so I won't be celebrating... but I will be in costume. *chick w/an egg carton strapped to her head & a slutty dress: "eggs over easy". HEH. *dude with the word "CEILING" taped onto his baseball hat, and taped over the sports team logo on his shirt, because he was a "ceiling fan"
i LOVE costumes where i have to ask what they are, because it's a pun. the best.